A few weeks ago I went to Heathrow to meet up with and see off my beloved aunt and uncle, who'd been visiting the UK from Melbourne. I got the tube from North London, they a taxi from Harefield. 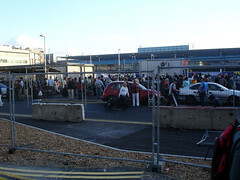 But I didn't see them because Terminal 3 was evacuated due to a bomb scare. I hung around in the crowd in case I managed to see them afterwards, and started thinking about the behavioural patterns below (disclaimer: obviously, I'm not a psychologist), some of which seem equally applicable to workplace situations. Disbelief: waiting to be told several times in case the officer and tannoy announcements aren't really serious. The choruses of "tcha" and "gah!" and "typical" that progress through the crowd. (Is there a Kübler-Ross progression of denial, rage and later acceptance at work here?) There's an irritable obedience, as if the inconvenience is deliberately and personally targeted at us. And that obedience is minimal - "No, keep moving back please, further back". There's a profound information need: people want a lot of info and context, immediately and continuously. Desire to manage/minimise uncertainty/danger (and to be reassured); it's also a participatory voyeurism. If we're going to be held up and miss the plane, we want it to be something good rather than a false alarm (also because this legitimises the officials). Officials should be omniscient: we assume they all have total information. Police and officials need an air of calm authority - they should and would never say "I don't know what the situation is". That they're bristling with kit and guns helps. But where there's an insufficiency of information, gossip and rumour necessarily emerge spontaneously. A police officer turns to another and murmurs, and we strain like night-time deer to catch and sift the sounds. News provision: many of us call or text friends to share news, boast of hardship or solicit sympathy. An hour in, there's a sound exactly halfway between a gun shot/explosion and something heavy crashing into a large metal object like a skip. Perhaps this is the destruction of the suspect package. It's an obvious sound, but none of the police react to it at all. Herding/clustering of people: together generally. In areas of perceived value: closer to terminal (ultimate goal, minimal effort), closer to the action (immediate goal: info - again, the psychological benefits - curiosity/rubbernecking, gossip, privilege), out of rain, near seats (comfort for longer waits), local gatherings: families, friends, people that are identified as similar. Is there an unconsciously ethnic/sociodemographic herding happening? Grudging retreat, as a herd, if a valuable area is devalued by police officers pushing people further back. We're shooed further away from the terminal by the police, into a space usually used only for the regulated movement of cars and buses - on foot it's a no-place, the interzone. We're held here as if this vehicle corridor is a real place, outside a processing space attached to the aerial corridor. An awareness that when the evacuation is over there will be a rush: hence positioning is important. The Dunkirk spirit is very mild at best. We're too put out by the delay, and too aware that when movement is restored, it's a zero-sum game at the bottlenecks. That awareness is like a background hum. The hum, that awareness - a crowd throb. Heightened awareness of factors that confer power, privilege, position or prestige. When some people move forward it's contagious: no-one wants to be demoted in position. We watch the officials closely for indicators. We're gradually jostling for position. There's a casual swaggering from those that are official or quasi-official (seen it all before... I am apart from the crowd...) - they have a carefree world-weariness as a defence mechanism: I'm good enough that can afford not to pay attention or look alert. As a counter to this ploy, I find myself immediately imagining offering help to the police on the dubious credentials that my company does some IT for police services - it's a clear desire to separate myself from the herd. Later, as the all-clear is confirmed, there's the extraordinary sound of a thousand luggage trolleys setting off and accelerating across rough tarmac all at once: a stampede.